Violation: ravaging olive trees in At Tawani, east of Yatta. 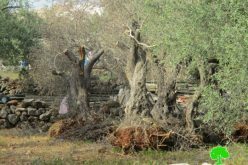 On June 10, 2012, colonists of Ma’oun broke into Fadel Rib’i olive field in At Tawanu village. 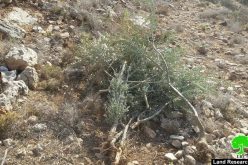 Fadel said that the 6 olive trees were cut or broken during the attack on his field, in the eastern side of the village. He accused colonists of Ma’oun with the attack. 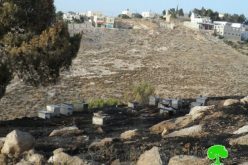 He added that colonists who walk through his lands to reach the nearby Avigal colony ravaged two olive trees on June 15 before the eyes of several eyewitnesses. Israeli patrols roam the area to ensure the safety of the colonists even when they launch their attacks on the Palestinians which spreads anxiety among Palestinians when working in their lands. Mohammad Rib’i also reported the colonists removal of the poles and barbered wires surrounding his field about a month earlier. In addition, eyewitnesses stated that the colonists are laying the foundation for the construction of new colonial units on the eastern side of At Tawani; they said that the colonists are cutting trees in the forest and building there. 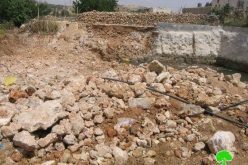 The locals expressed their concern over the matter while keeping in mind when the Israeli Occupation Authorities destroyed Abu Ghnaim forest to allow the colony of Har Huma to rise in its place. 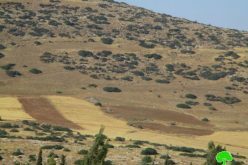 Saber al Hreni, At Tawani Village Council, said that the Israeli Environmental Protection Agency took over the land years ago and planted it with forest trees; now, the colonists are expanding there. 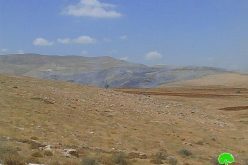 Confiscating irrigation networks and ravaging crops in Al Baq’a – Hebron city.